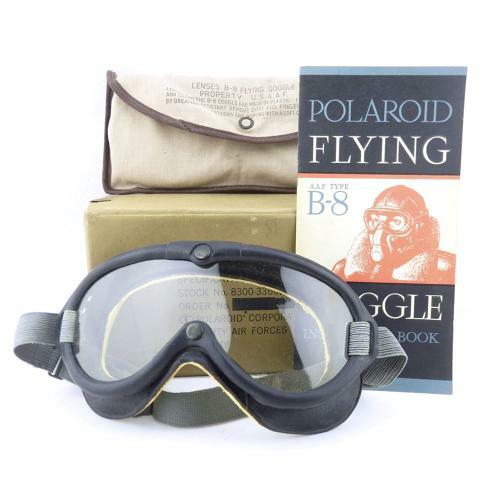 Goggle, Flying Type B-8. By the Polaroid Corporation. The rubber frame is marked 'Type B-8', 'PROP USAAF' and is in excellent condition. The chamois backing is very soft and clean. The strap is also very good, though lacking elasticity in the two outer sections. Fitted with a clear lens in excellent order. Comes with the correct B-8 cotton pouch containing all 8 spare lenses - greens, amber and clear tints. These appear to be in very good condition apart from the usual slight warping issues. With 7 page instruction leaflet and card carton of issue (both correct Polaroid issue) showing just light wear/use. Overall this is an excellent set of goggles/spares. Stock code G22930.